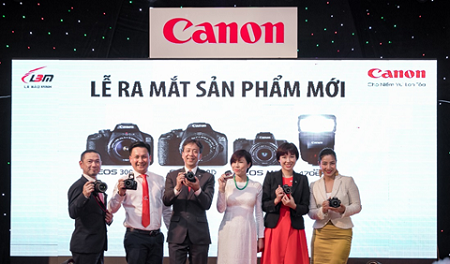 Ho Chi Minh City, 2 May 2018 – Canon today announced the launch of the EOS M50, its newest mirrorless camera powered by the new DIGIC 8 image processor for outstanding image quality. Packing a punch with 4K movie shooting ability and an improved Dual Pixel CMOS AF, the EOS M50 is primed for shooting ultra-high definition movies and boasts of excellent precision focusing even under low light conditions. 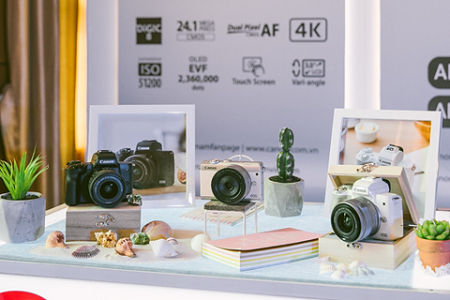 With the Touch & Drag AF, users are also able to select and move the AF frame via the touch panel while looking through the built-in 2.36 million dot Electrical Viewfinder (EVF), so even the most ephemeral moments can be captured and transformed into lasting memories. "Encompassing several firsts in the EOS M mirrorless series, the EOS M50 will thrill aspiring movie creators with 4K movie shooting function for capturing breathtaking high-definition videos," said Naohiko Hayashi, Senior Director and General Manager of Regional ICP Sales and Marketing Centre, Canon Singapore Pte. Ltd. "This latest enhancement signals Canon's commitment in strengthening our mirrorless series with continuous innovation and the versatile EOS M50 offers the perfect balance between convenience of its compactness and versatility of DSLR cameras." Enhanced with the 4K movie shooting function1, the EOS M50 is able to produce footage four times the resolution of full HD with exceptional depth and clarity. The 4K Frame Grab function allows for high resolution images to be extracted from footage taken, ensuring not just remarkable still photo performance but also the preservation of memories and milestones. With the dedicated time-lapse movie setting, capturing magnificent time-lapse videos of streetscapes and landscapes in 4K will be a breeze. For effortless, ready-to-post movies, users simply need to pick their desired shoot interval from the scene selection. Additionally, with Combination IS, users can expect reduced camera shake during movie shooting. Even when using non-IS lenses, the EOS M50’s built in five-axis stabilisation feature ensures that users are able to enjoy seamless and resolute video capture. Users can also shoot in high frame rate of HD 120p to render rich slow-motion movement and expression when played back. Powered by the new DIGIC 8 image processor and an approximately 24.1 megapixel APS-C sized CMOS sensor, the EOS M50 is able to capture crystal clear images even in dimly lit conditions. Through the use of the built-in Electronic Viewfinder (EVF), users are guaranteed a highly accurate image representation of what is seen by the camera sensor, and can shoot without glare interferences even under bright sunlight. With the normal ISO speed of 25600 and expandable to 51200, users can achieve clear shots with minimum noise for photos even in low light conditions. Unique to the EOS M50, the newly added Silent mode (applicable in scene mode) mutes the shutter sound, making the mirrorless a perfect device for capturing classical concerts or a sleeping child. The EOS M50's improved Dual Pixel CMOS AF covers a larger AF area with up to 143 AF points2 (covering 88% horizontal by 100% vertical area) when a compatible lens is attached, offering high speed AF and impeccable precision over a wider area. The larger AF area also means achieving fast, accurate and smooth AF is possible even when capturing moving subjects. Adding a boost to this capability is the Touch & Drag AF feature, which allows users to easily switch the subject of their focus by dragging the AF frame directly on the LCD panel even while composing a shot through the camera’s EVF. With a continuous shooting speed of approximately 10fps in one shot AF and 7.4 fps in Servo AF, constantly moving subjects such as children at play or pets in action can be captured with precision. The first in the EOS M series to be equipped with a Vari-angle LCD monitor, the EOS M50 gives users the freedom to shoot from high to low angles more nimbly. Sporting a host of navigation features, the intuitive touch panel ensures that users can capture significant moments swiftly. The EOS M50 is also designed for single handed operation, with buttons and dials located on the right side of the camera so users can adjust settings even while looking through the EVF. To create effortlessly artistic images, users can tap on the improved preset Creative Assist function in Auto Mode to achieve their desired effect. Available in stylish Black and White, the EOS M50 also have accompanying accessories like compatible jackets and straps for everyday usage. With Wi-Fi and Near-Field Communication (NFC) connectivity, users can easily pair the EOS M50 to their smart devices for sharing of images and videos. The Canon Camera Connect app (available iOS and AndroidTM) also allows users to have real-time control of camera settings and transferring of images automatically when paired with smart devices in real time. In addition, the built-in Bluetooth low energy technology maintains constant connection to a compatible smart device at low power consumption, allowing users to view images and start remote capture from the camera even when it is in Auto Power Off mode. Users can also control image playback and slide show when the EOS M50 is connected to a TV or projector via smart devices. EOS M50 is available in three kit options: EF-M15-45mm f/3.5-6.3 IS STM kit, EF-M15-45mm f/3.5-6.3 IS STM + EF-M55-200mm f/4.5-6.3 IS STM kit and body only. 1 During 4K video recording, only contrast-detection AF is available. For more information, please visit vn.canon.